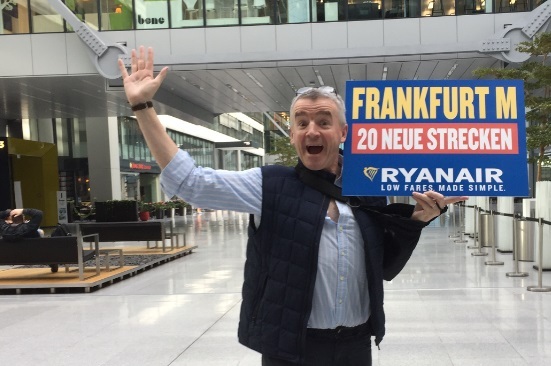 Ryanair, Europe’s No.1 airline, today (28 Feb) launched a new route from Glasgow to Frankfurt, with a daily service beginning in October, as part of its extended winter 2017 schedule, which will deliver 1.4m customers at Glasgow International Airport. Frankfurt is the latest major European city to be connected to Glasgow on high frequency, low fare services including Berlin (daily), Dublin (3 daily) and London (3 daily), alongside a wide range of winter sun routes, on the lowest fares, making Ryanair the ideal choice for Scottish business and leisure customers. Ryanair’s Glasgow summer 2017 schedule is attracting record bookings, with more frequencies to sun destinations for summer family holidays, including new routes to Lisbon and Valencia, and an even better customer experience, as Ryanair continues to roll out its “Always Getting Better” improvements. Ryanair celebrated its new Glasgow-Frankfurt route by releasing seats for sale across its European network at prices starting from just £9.99 for travel in March and April. These low fare seats are available for booking on the Ryanair.com website until midnight Thursday (2 Mar). “We are pleased to announce a new route from Glasgow to Frankfurt am Main, our third new Glasgow winter 2017 route following Krakow and Madrid, with a daily service starting in October. Scottish customers and visitors can look forward to even lower fares when they make advance bookings for their summer or winter holidays, so there’s never been a better time to book a low fare flight with Ryanair. “The introduction of Ryanair’s direct service to Frankfurt is a first for Glasgow Airport and great news for our passengers. This daily service will link two cities with much in common and further strengthen our European connectivity. Frankfurt is one of the world’s leading financial hubs and home to the European Central Bank, while Glasgow is often cited as Scotland’s economic powerhouse.